Because today is a very exciting day! I finally get to formally introduce you to the cookbook I made for y’all. 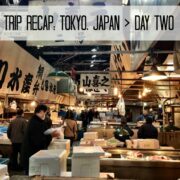 Back in March I spilled the beans about my exit from the financial industry, so that I could focus on cooking and CGM full-time. Also, Page Street Publishing had approached me about writing a cookbook, and I was so excited I threw myself into cooking and testing recipes. It’s been a long journey that started back in January of this year, and today I am so effing pumped to finally reveal cover and title to you! I can’t tell you how good it feels to finally share the title and cover. The cover of “Modern Comfort Cooking” represents me to tee. 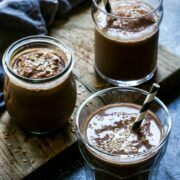 Dark and moody with a soul-satisfying meal that you will enjoy over and over again. The cover feels good to me, as if I was having you over for dinner, and we had just sat down. So I hope it feels good to you, too! Okay, a few things about the cookbook. There are over 80 brand-spanking new recipes for you to try! 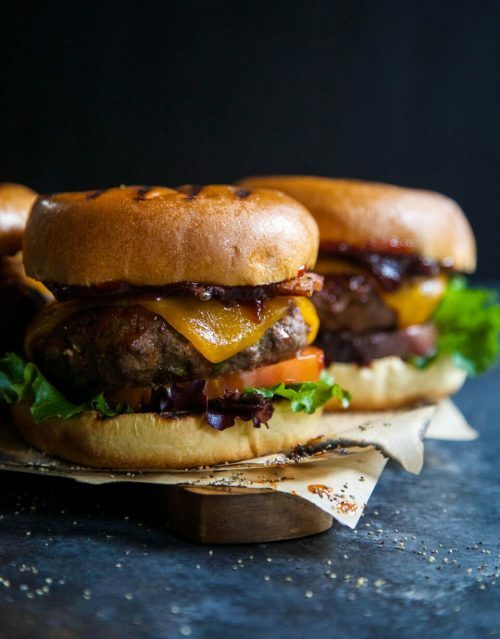 The recipes break out into six chapters which cover ideas for everything from “Brunch” to “Classic Comfort Food” to “Modern Drive Thru.” My favorite chapter is definitely East Meets West: how can you say no to a Korean BBQ Burger with Miso-Candied Bacon? 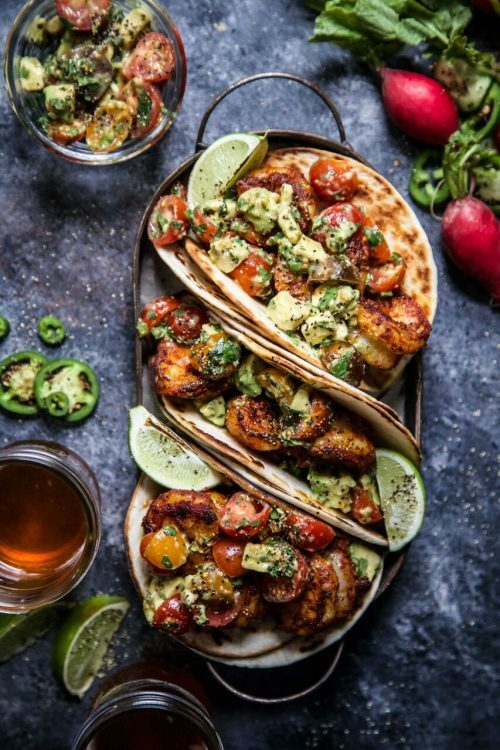 Or Mumbai Shrimp Tacos with Avocado Salsa? Or Korean Pulled Pork Lasagna? 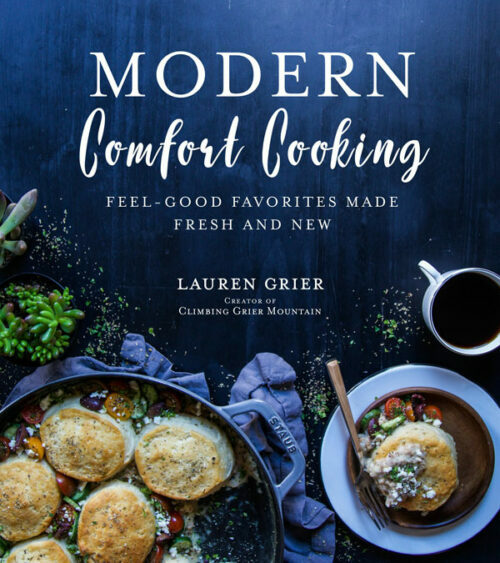 Since I can’t exactly have each of you over for dinner, I hope you will invite me into your home and kitchen by ordering a copy of MODERN COMFORT COOKING. The cookbook won’t hit shelves until December 5, 2017, but that’s only a few months away! Which means pre-ordering is the best way to guarantee you will have the cookbook in time for the holidays! Here a few online retailers where you can PRE-ORDER your very own copy! Since MODERN COMFORT COOKING wouldn’t be possible without y’all, I am giving away 3 SIGNED COPIES to three lucky readers! All you have to do is leave a comment below telling me your favorite comfort food! This giveaway will run until October 2, 2017 and is open to US residents only. THANK YOU for all your support during this entire process! I can’t wait for MODERN COMFORT COOKING to enter your home. I know you will love it as much as I do. a big bowl of mac and cheese! Congrats girl!!! The cover is stunning! Cant wait to get my hands on it!! My favorite comfort foods are chicken and dumplings and chicken pot pie! Your Banana Cake with Chai Vanilla Frosting, it is perfect for breakfast, lunch, dinner and oh yeah dessert too! : ) and YAYYYYYYYYYYYYYYYYYYYY!!!!!!!!!!! I am so happy for you! The cover is PERFECT! Mac am cheese is my favourite comfort food. I love the cover and the photography is amazing! I love to cook so I can’t wait to get my hands on this cookbook. Pizza is most definitely my comfort food of choice with any sort of pasta coming in at a close second. Amazing! I can’t wait to check out the final cookbook. Congratulations on pursuing your dream and making it happen! 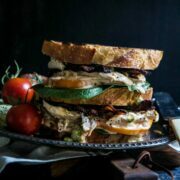 My go-to comfort food is definitely a super gooey and golden grilled cheese sandwich. I can’t get enough of them. Cheers! I love homemade spaghetti with meat sauce! The cookbook cover is beautiful! I ordered one! Biscuits and Gravy have to be my favorite comfort food. Anything with potatoes is my comfort food! Congrats girl, so happy for you!!! My fav comfort food is always pasta, usually with my homemade red sauce topped over fresh pasta noodles. Wow! Great Cover! Pizza is definitely my go to comfort food and tacos may be a close second, though my daughter is definitely in the Mac & Cheese camp! I LOVE the cover! I can’t wait for your book girl – so pumped for you! Congrats! And my fav comfort food is classic chicken noodle soup!! Comfort food for me is either spicy or cheesey, even better if it is both! I am so excited to add this book to my collection. Your photography always makes me want to rush home and play in the kitchen. Congrats!! My comfort food would be cheese grits – they are warm, creamy, and filling. Can’t wait for the book!! Now that we’re heading into fall, soup with a grilled cheese sandwich is my go to comfort food. My go-to comfort food is a toss up between Pasta with Meat Sauce and/or King Ranch Casserole. I will definitely be pre-ordering your cookbook-your food looks amazing! That burger . . . come on!! Pasta…anything pasta. That’s how I spell comfort food. And yes, I agree with everyone that your cover is gorgeous! Since moving down south, my comfort food is chicken and dumplings. My all time favorite comfort food is chicken and dumplings! Ahh! A huge congrats to you! What a beautiful cover! I can’t wait! My favorite comfort food is definitely macaroni and cheese. Mashed potatoes with gravy and stuffing. Rice with a little butter and onion salt. Congratulations! My favorite comfort food is chicken and dumplings. Congratulations!!! A beautiful cookbook–how exciting!!! My favorite comfort food of all time is the cubed steak and gravy with mashed potatoes that Mama used to make. She was the “Gravy Queen”! She browned the meat with onions and peppers and then made pan gravy. The steak would simmer in that gravy until it was fork-tender. Mama’s been gone for a while, and I sometimes make this meal for myself, but it never tastes as good as it did when Mama made it. Carrot cake with lots of cream cheese icing! The cover is outstanding!! 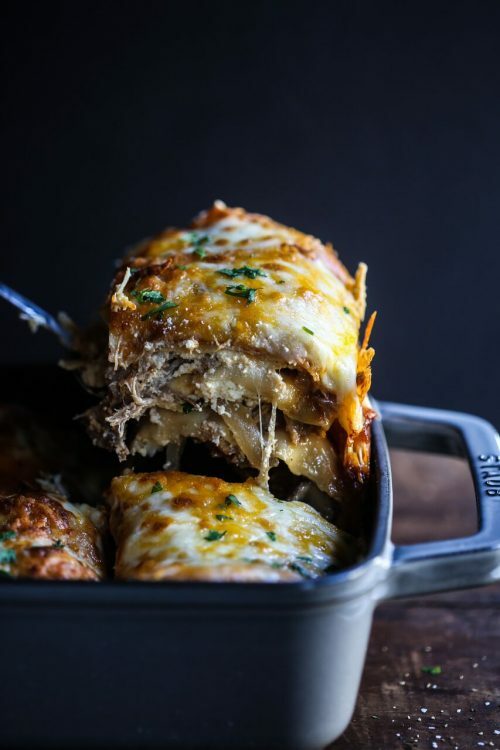 Can’t wait til December to see the insides…my favorite would be french onion soup….your French Onion Gnocchi Casserole sends me to a happy place definitely. Warm bowl of Homemade Chicken Noodle Soup! Congrats….the cover is beautiful & the recipes sound amazing. I mean Miso-Candied Bacon, come on! Baked ziti! Easier to make than a lasagna, more substantial than spaghetti. 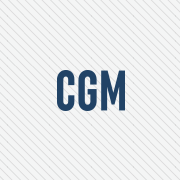 Love your site and looking forward to the cookbook! Comfort for me is dark chocolate, I love chocolate babka, not too sweet. Congrats! My favorite comfort food is probably bread…I’ve been known to eat an entire baguette in one sitting. And if there’s cheese to go along with it, all the better. And if you heat it (like grilled cheese or a panini), I’m in heaven! Congratulations! My all time favorite comfort food is stuffed cabbage. My favorite comfort foods are my grandmother’s homemade chicken and noodles (including the noodles) and my mom’s eggplant parmigiana. Mac and cheese and cinnamon toast are comfort foods to me! Congratulations on the book! Looks great!! The cover is gorgeous, Lauren! Congratulations! As far as favorite comfort food – mac and cheese all the way! Love the book cover. My favorite comfort food is lasagna! Pizza would probably have to be my favorite comfort food! Congrats on the new book! I love the cover! And what a perfect time for the book to be released. Congrats!!! Favorite comfort food? I could go with something pasta, but a big mug (always a mug) of wild rice and mushroom soup makes me feel all warm and cozy. My favorite comfort food is my families Chicken soup recipe! I love lasagna….so many happy memories made around the table with that dish front and center! Those shrimp tacos have my name written all over them. What a beautiful book – congratulations! I am excited to see it IRL!! I’m going to have to say a Tuna Casserole, creamy and with the potato chip crunch on top, gets me every single time! Congrats on the publication of your cookbook! So exciting. I have way too many favorite comfort foods, but the one I’m thinking of right now is classic mashed potato with plenty of butter and fresh cracked pepper. Thanks for the giveaway opportunity! Congratulations!! My fave comfort food is potato salad. My go to comfort food is chili with rice….cheese, sour cream and tortilla chips. Congratulations on your book. Savor the moment; looking forward to savoring your recipes. my favorite comfort food is a big bowl of pasta! my favorite comfort food is cornbread and fried okra!!! A rich split pea soup is my all time comfort food! Definitely homemade mac and cheese! !